Rotary Club of Morgantown North and guests gather for World Polio Day celebration. Members of the Rotary Club of Morgantown North hosted a World Polio Day event on Tuesday evening entitled “Celebration to End Polio.” Held at Atria’s Restaurant in the Holiday Inn / University Area in Morgantown, the event drew Rotarians from several counties. President John Lichter welcomed the group that had convened for an evening of fellowship and awareness of Rotary International’s role in the eradication of polio. Member Summers Harrison, a retired 44-year pediatrician and ER doctor, who worked in Morgantown for many years and who, during his younger days, cared for Polio victims, offered an interesting perspective into the personal world of Polio, plus a professional outlook about how the disease has changed through his years of working in the medical profession. Rotary International aired a Livestream video via YouTube.com focusing on the Global Polio Eradication Initiative, a public-private partnership led by national governments with five core partners — the World Health Organization (WHO), Rotary International, the US Centers for Disease Control and Prevention (CDC), the United Nations Children’s Fund (UNICEF) and the Bill & Melinda Gates Foundation. Its goal is to eradicate polio worldwide by 2020. This year marks 32 years since Rotary lnternational launched Polio Plus, its campaign to rid the world of polio. Beginning on Rotary’s anniversary, February 23, Rotary members worldwide begin holding events to celebrate over three decades of polio eradication progress and raise funds to continue the fight to end the disease worldwide. Since 1985 Rotary and its partners have helped reduce the number of cases from 350,000 annually to fewer than 400 in 2014 and fewer than 20 in 2016. The organization remains committed until the disease is eradicated. Since 2013 the Bill & Melinda Gates Foundation has been matching every Rotary dollar donated 2 to 1. The Foundation has committed to continue that match for the next three years. Rotary International has challenged their members to contribute $50 million per year for the next three years. 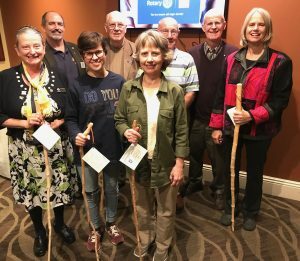 The Rotary Club of Morgantown North offers handmade walking sticks to raise funds for Polio Plus. If hiking is to your liking, these walking sticks can be purchased from the club.